Robust Features Coupled with Easy Management - Serves files easily - Backs up data effortlessly - Streams music and video quickly - Shares printers with ease - Works with Windows, Mac, and Linux - ReadyNAS NV+ was designed specifically for home offices, small businesses and workgroups. Never before has there been available a cost-conscience Network Attached Storage (NAS) appliance packed with robust high-end server features, including Gigabit Ethernet, hardware RAID, system monitoring capabilities and built-in backup. 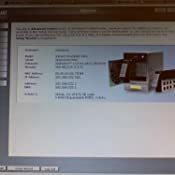 ReadyNAS couples out of the box deployment and easy management with robust file serving and data redundancy. 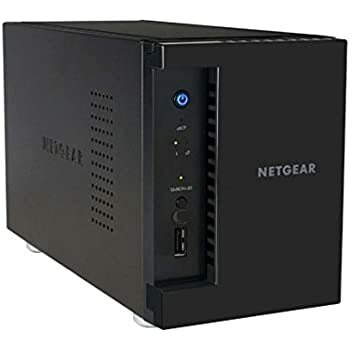 Whisper quiet, and about the size of a shoebox, the NETGEAR RND4000 ReadyNAS NV+ 4-Bay Gigabit Desktop Network Storage device offers homes and small businesses an easy-to-configure and cost-effective way to store your data and serve your digital media. With its several advanced server features, you will have true peace of mind knowing that your irreplaceable data is safe and secure. 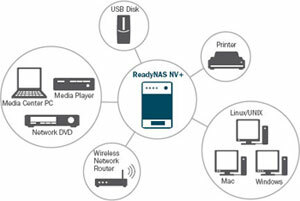 The ReadyNAS NV+ offers an easy-to-configure and cost-effective way to store your data and stream your digital media. View larger. Use the ReadyNAS+ to stream music and video, share network printers, and share files across multiple platforms. A way to store and protect up to 4 terabytes of data. 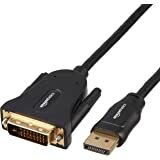 Compatibility with Windows, Mac, and Linux. 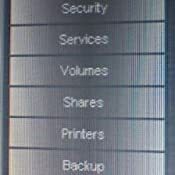 Ability to share network printers. 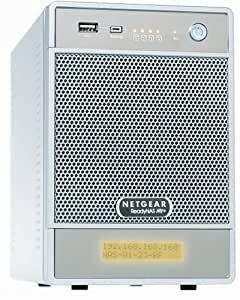 Not much bigger than a shoe box, the NETGEAR ReadyNAS NV+ 4-Bay Gigabit Desktop Network Storage device is compact, but powerful. Chances are that you've got a huge portion--if not all--of your business data or personal life digitized. Your kids' birthday videos, photos, important tax records, customer files, music--it's all digital. Until recently an external hard drive has done the job. But your storage solution is near capacity, and you now realize that it won't be long before your 24/7 usage burns it out. And when that happens, you will either have to kiss everything you've ever created good-bye, or pay a pretty penny trying to retrieve it all. 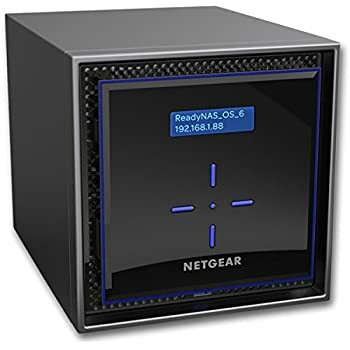 The NETGEAR ReadyNAS NV+ is an ultra-compact box with four empty bays ready to store up to 4 terabytes of data, and is designed to fit easily on your desktop. 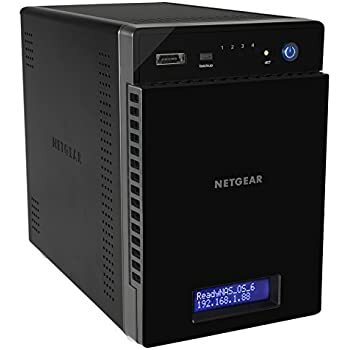 NETGEAR also offers the Ready NAS NV+ in the ReadyNAS 2x750GB Drives ReadyNAS 2x500GB Drives, ReadyNAS 4x500GB Drives and ReadyNAS 4x250GB Drives models. Once connected to your network, you can store and protect all of your digital data and stream your digital media. What truly causes heads to turn with the ReadyNAS NV+ is its RAID functionality, along with its own X-RAID technology. 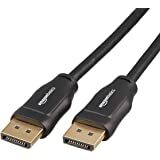 Combined, these two features that are normally found only in high-end servers will ensure that your data will never be corrupted or lost due to hardware failure. 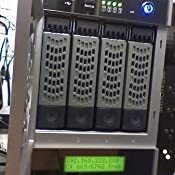 The device's RAID functionality, or Redundant Array of Independent Disks, copies, splits and shares your data across the hard disks within the device, so that should one of the drives fail, the data can be rebuilt with the remaining drives. Without RAID, once a failure occurs, you risk losing all of the data stored on the drive. ReadyNAS's patent pending X-RAID technology automates the volume expansion as you scale from the two included disks to four disks. 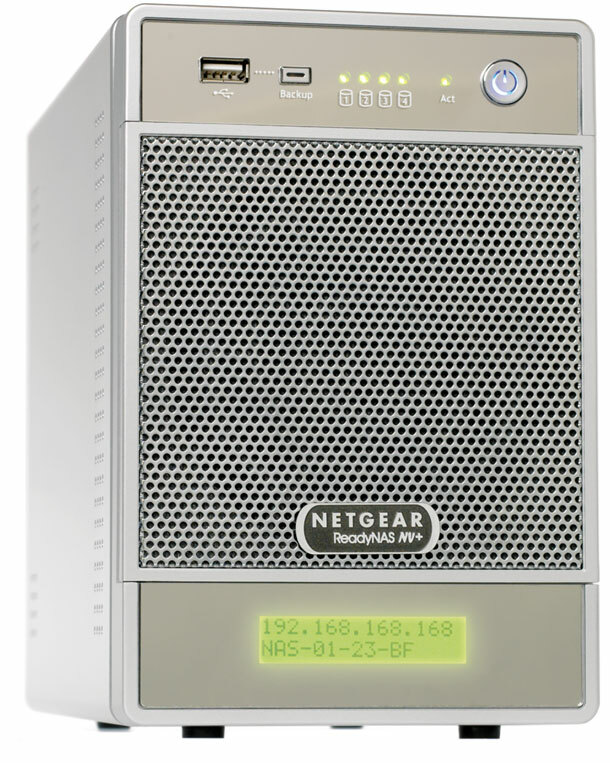 (The ReadyNAS NV+ includes additional expansion slots for two additional hard drives.) In short, X-RAID automatically manages the RAID details for you, so you don't have to spend the hours that it normally takes to format the disks. Simply put, you won't find a simpler or more secure way to protect and store your data. 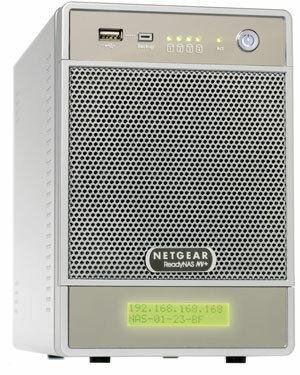 With the ReadyNAS NV+, the days of storing your digital files across several computers or storage devices are over. 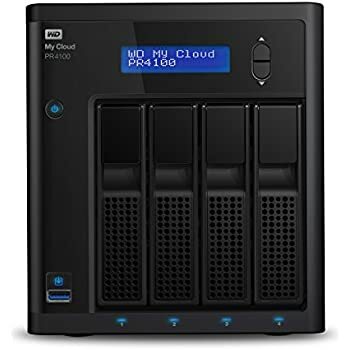 This device is scalable to up to two terabytes of data, which means that you can bring all of your data together for fast and easy access and file serving to multiple clients simultaneously. And as any small business knows, having a sound backup strategy is essential. With the help of ReadyNAS NV's EMC Retrospect backup and recovery software, you can set automatic backups of all of your network clients to your ReadyNAS. 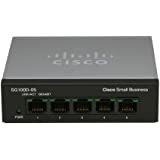 Additionally, the device includes an integrated backup manager that enables one-button backup to an external USB HDD for offsite rotation, or to remote servers for even greater security. If something should go wrong with one of your disks or if performance has been compromised, the ReadyNAS NV+ offers advanced-server monitoring features that alert you via email when something is amiss. The device will also shut itself down if the operating temperatures of the disks are too high. But don't think that the ReadyNAS NV+ doesn't know how to have fun. If video or other media is your business or passion, you can use your ReadyNAS for streaming to multiple devices at the same time without the need to keep your desktop computers running. The ReadyNAS includes built-in media servers, including Slimserver and iTunes, that will let you stream audio and video to devices on your network. With an easy-to-use Web browser interface and setup wizard, ReadyNAS can be configured quickly. 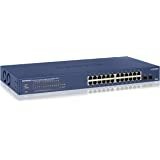 Simply plug the device into your network, power up, and you'll be ready to go. 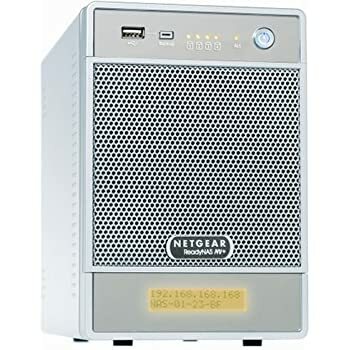 The ReadyNAS NV+ also includes three USB ports, which can be used to connect a USB printer, a back-up power supply, external drives and more. The device measures 7.9 x 5.2 x 8.7 inches (H x W x D), and weighs 10 pounds without the disks. The ReadyNAS NV+ includes a five-year warranty. ReadyNAS NV+ with 4 empty hard disk trays, getting started guide, warranty card, power cable, Ethernet cable, ReadyNAS Installation CD (ReadyNAS Discovery Utility, 5-Client EMC Retrospect Professional for Windows, 5 Client EMC Retrospect Desktop for Macintosh), and 16 screws for future HDD installation. This warranty applies only to products purchased by the original purchaser and is non-transferable. The warranty does not apply to products that have been abused, misused, modified, or repaired by anyone. Normal wear and tear is not covered under warranty. We reserve the right as final authority on whether the products should be refunded or replaced. We make no other warranty and no implied warranties, including any warranty of merchantability or fitness for a particular purpose. Our maximum liability hereunder is limited to the purchase price of the products. In no event shall we be liable for any consequential, indirect, incidental or special damages of any nature arising from the sale of the product. I've owned mine for 7 years. The memory was upgraded though it's still slow as molasses. At some point the Firefly music streaming service stopped working with iTunes. The interface is dated, but surprisingly Netgear still releases updates for it to address security issues. The power supply finally went out a month ago. I spent $120 on a replacement to revive it, but technology has moved on and I'll be migrating to something new at some point. It's still one of the more attractive NAS cases out there. It's a little more expensive than other brands I've seen, but I'm very happy with it and didn't mind spending a little more to get exactly what I wanted. 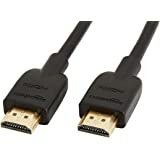 It works great with my Linux and Windows computers at home (and also works with Mac, although I don't have one to test with). For Windows you map a drive through Windows Explorer, for Linux you run "mount" using NFS. I was able to share and use the same files/directories on both operating systems without any problems. The fact it works so well with Linux was a big reason I bought this over other brands I looked at. However, note that according to its documentation, its print server only supports Windows and Mac clients. For me that's less of an issue since I primarily use my Linux for development and can print everything on Windows. It came ready to go out of the box, the disks were already set up for X-RAID, their proprietary RAID technology that's basically RAID-5 but manages volume expansion so you can add/replace disks more easily. 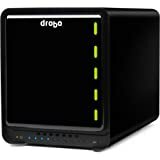 It also offers RAID 0, 1 and 5, although since it has 4 disk drive bays and drives are so cheap now, I'd recommend only using RAID 5 or X-RAID. It's hot swappable so you can replace disks without shutting it down. If a single drive fails, you can replace it without losing any data (except RAID 0). If you want to use RAID 0/1/5 instead of the default X-RAID, change it before you move files to the system (or back them up first), since according to their documentation changing it will erase all of the data. It supports gigabit ethernet speeds, but my PCs don't yet, so the transfer rate copying files to the ReadyNAS was about 3-4 MB/sec, and about 9-10 MB/sec copying from it. According to CNET's editor review, they were able to write a 5 GB test file to it in 18 minutes, and read the file back from it in 13 minutes (the 13 min read time was the fastest of any of the NAS servers they tested). The RAIDar software it comes with found it on the network right away. Among other things, RAIDar shows you the current RAID status, disk usage, fan speed, and the temperatures of the unit and each drive. The web interface provides alot of control over it. One feature I really like is that you can configure it to send alerts to multiple email addresses (and text messages to your cell phone) for various conditions such as drive failures, excess temperatures, disk quotas exceeded, power failures (if UPS connected), etc. Another feature I like is an option to let the drives sleep after a configurable period of inactivity. With the latest firmware, I was also able to use SSH to connect directly to its filesystem. Obviously you want to be careful if you do this to avoid changing/deleting system files. That would not be good. 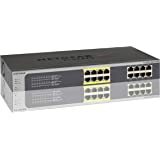 - I can't access the ReadyNAS while connected to my office's VPN, but that's a security "feature" of the VPN software to secure the company's network and also to prevent IP address collisions. Just thought I should mention it in case other people have the same problem. The VPN software is configurable to disable this, but turning it off leads to other problems since my home network subnet is also used at work (they tell us to use a specific subnet at home to avoid collisions but my router doesn't allow changing the subnet). - Its built-in SMTP to send the email alerts didn't work for me; I had to provide my own email account's SMTP settings to get it to work. Their user guide indicated that some network issues require this, although I'm not sure why mine did. - As mentioned above, the print server doesn't support Linux. I haven't used all of its features yet, but so far I really like it and am glad I went with this one. UPDATE 10/29/2008: The latest firmware updated the web interface. It doesn't work with Firefox 3.0, but I have the IETab Firefox extension so I set it up to use Internet Explorer. UPDATE 3/3/2013: Still working great. It's been running non-stop for the last year or two (before that, I turned it off when I didn't need it). No problems at all. Also, an update to my last update: I'm using the latest Firefox (18.0) and the web interface works fine with it. 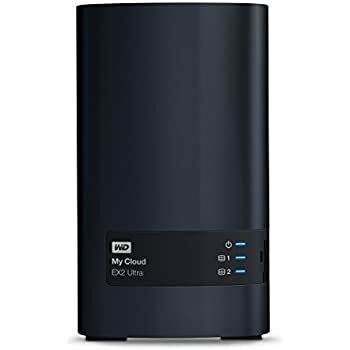 I purchased this device with the 4x1000gb drives, which works out to a 2.7tb raid 5 system. 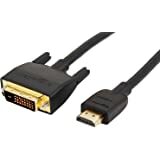 I found it was very easy to set up, and it did not require me to install the cdrom to access it, for all my various computers. The network speeds were better than any of the mybookworld units I used in the past, and the web based configuration is very good. My only complaint is when, I plugged in additional USB devices, the access to those devices was and is extemely slow. 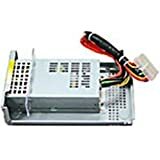 My recommendation is to buy the unit with as much drive space as you can afford. Plugging in additonal USB drives is almost not usable. Be careful not to set drive quotas if you do not need them, and check for operating system updates before you start using the ReadyNas. The automated backup system is great, but avoid backing up to USB if possible. I tested and us regularly Rsync, which works great even across the Web. 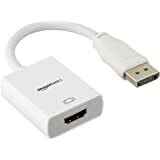 I highly recommend this device for the small business user or multimedia user. I have 15+ PC's and 5 Xbox 360's sharing multimedia files at the same time on one server, and have seen no noticable speed issues. Movies and music are served up smoothly and without any issues. 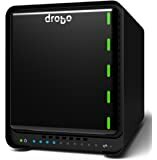 This device is in no way as fast as internal hard drive storage, so if you are editing large files, do it locally, then upload them to the server. I now have 4 of the 4 bay units running in various configurations, some over two years now. No failures as of yet and expansion has been pleasantly easy. Applied firmware updates have gone smoothly and without any issues at all. I have expanded to 2 of the larger 6 drive units and seen transfer speeds in excess of 100mbps. 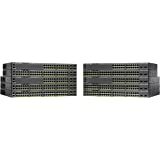 If you are building a video storage server dealing with blu-ray, move up to the bigger 6 bay units with dual gigabit interfaces. I have the new Seagate 3.0tb drives in six bays and have a full raid server with 15.0tb+ available storage space. With the right software on your network, these can serve as archive storage or media servers with no issues. I offer that as an I.T. 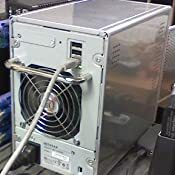 Expert, no where did it suggest this would replace a $15k file server. If you can't make this work on your network, your in the wrong line of work, or need basic network training. These will make a well rounded media server for any home and function as a great archive server for the office. All this at a fraction of the of the cost of a commercial server in the hands of some of the idiots rating this product. of data in a raid configuration, with full media support and unattended automated rsync backups over the lan or wan. I really havn't see a more reliable or affordable solution for the masses then this line of products. This is miles above the MyBookWorld server platform and the countless other attempts at this out there. Now we just have to wait for the affordable hard drives to get bigger than 3.0tb!